Points of conformation: Long head with hourglass muzzle, which is a breed distinguishing feature. Round forward tilting ears Lithe medium length body, long legs and a long tapered tail. Coat: Medium short and closely lying. Color: Rich shiny chocolate brown with no other markings. Grooming needs: Minimal grooming needs, weekly brushing. Is a Havana Brown cat right for You? 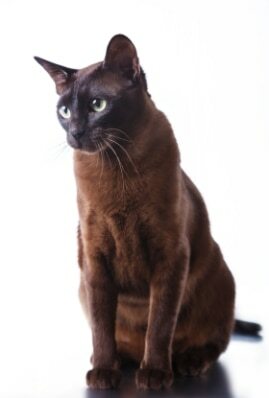 The Havana Brown is playful and a high energy cat with a dog-like personality. They can be leash trained and have been known to fetch. They crave close human contact and will bond strongly with a ‘favorite person.’ They are adaptable, but prefer a less chaotic home and can take a while to warm up to new people.